My best friend Tori and I have a long history of going to concerts together. Long as in we've been doing it since like 1996. And we've seen a TON of groups (over fifty, I just tried to count and stopped there) perform in several different venues. We've had amazing tickets to just about every single one (but not Pennywise, we hated them after that, but that's another story), she's just talented at snatching up great seats. The adventure began for me at like 4pm, as I headed down to Fort Pierce, blasting the Buzz on the radio. The DJs were making reference to the idea that Black Label Society would be playing that night as well. Not sure where that came from, and there was no mention of them at the actual concert, so nothing lost. Traffic into West Palm wasn't too bad, but we needed dinner when we got off, and of course both Southern and Okeechobee Blvd aren't the best for finding a quick bite. We ended up at a Subway near Okeechobee & Royal Palm, ate quickly, and headed down through the traffic toward Sansbury's Way. We parked and started making our way in. 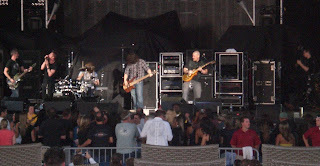 The concert began at 7pm with Saving Abel, a band whom we saw perform in December at the Buzz Bake Sale. They only got about 30 minutes, which was kinda sad. More importantly, we didn't get to our seats until about 7:10, since security made boys and girls wait in different lines (for the pat-down), and people are idiots and got in the wrong line until they got to the front, then tried to cut over and merge. We also got to see my friend Michelle (whom I mentioned in the previous post) who was there with another group of people. Glad we saw her then, trying to catch up later woulda been difficult! Then, about 7:50, Seether went on. They were okay, "not very chatty," to quote the girls behind us. They also did a couple covers, which was intriguing. 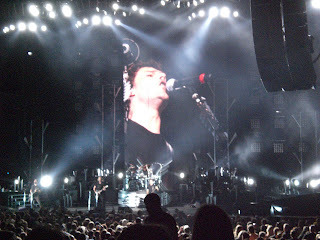 They played for about 45 minutes, and during the set-up for Nickelback, Tori and I headed over to see the merchandise. We were rather appalled that t-shirts were $35 (babydoll tees were $45!) and hoodies were $80. There's no need for the prices to be this extreme, and all three bands were charging similar prices, so it's not like Nickelback was trying to play off their "big-nameness." We scooted away. 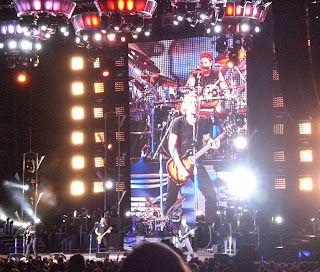 About 9:05pm, Nickelback took the stage, and did a good job of pumping up the crowd. They mentioned that they only had one more show in this tour, so they were ready to tear the roof off and yada yada. They talked about playing until midnight. That was crap, they stopped at 10:46. This was AFTER they fake-stopped at 10:31, only to come on again three minutes later. Whatever. Their set was great, and I appreciated their choices. It was strange that they played a good deal of songs from their first couple albums, since this was technically a tour for their third album. No complaints from me, tho! 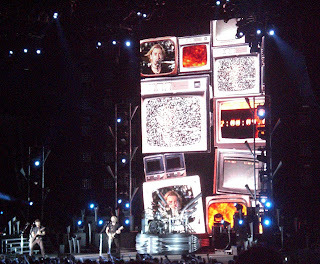 They had some awesome pyrotechnics and visual effects, including a giant screen and lots of lights. They do a good job live, and record well (took six videos, one of which is below). The only strange thing was that they did two covers... one of "Friends in Low Places," and one of some country song that I had never heard, but apparently "all the ladies here are going crazy over this song!" Tori knew it, so at least it wasn't a crap song. 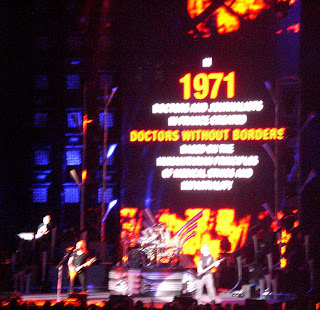 They did an amazing thing with "If Everyone Cared," and had this great montage displaying on the screen, of everything that musicians have done to make big differences in the world (like Bono and AIDS), and about others who have taken strides to make a difference (like Nelson Mandela). 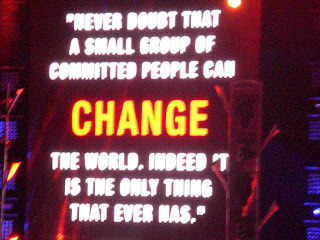 It was a very inspiring political agenda (which is rare for me to say since I am usually against such things). After the concert, we got out of the traffic nightmare that is Coral Sky (and I'll forever call it that, regardless of how many name-changes it will go through) after nearly an hour, and got some gas. After that, we hit the turnpike, and were lucky that all the traffic was going south. I got back to Melbourne a few minutes before 2am, which was earlier than I had anticipated when the concert started, so that worked out pretty well.